Hay Bro Sis...Nearing the end of 2015, the four-wheeler automotive markets will increasingly heated row with the birth of a new car is a hero from a variety of well-known car manufacturer in the world. The competition is hotting up will occur at various segments of the cars, one of which is a double-cabin pickup truck (Pick Up Double cabin) which is now more and more consumers are interested in dual-purpose car. 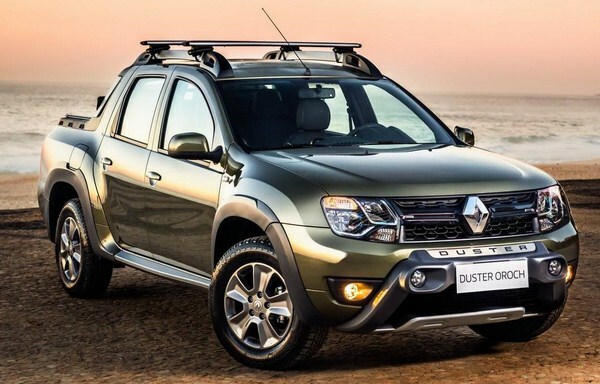 Because popular of the French car manufacturer, Renault has released a brand-new hero figure that Renault Duster Oroch were ready to enliven and heat up competition in the market segment of the double cabin pickup there. Renault Duster Oroch will plunge into car segment with double cab pickup will face old players who are already well-known toughness the Nissan Navara and Mitsubishi Triton. Renault has indeed been introduced in the mid 2015's in the exhibition Buenos Aires Motor Show 2015 last June. By inheriting the name of the car before the Renault Duster SUV, pickup double cabin looks more cool and more gahar. For Renault Duster Oroch specification itself has dimensions of length 4700 mm, width 1800 mm and height of 1,690 mm, which produces big and manly appearance. By having the stop lamp futuristic headlamp and it will produce more and stout appearance, macho and modern. Double cabin pickup Renault flagship will also offer several standard safety and convenience features such as braking ABS, dual Airbags, Air conditioning, Power Windows, roof bars and 16-inch alloy wheels. Unfortunately Renault itself has not announced the price of the car of their latest double cabin pickup.